Palestinian prisoner Bilal Kayed is continuing his open hunger strike on the 22nd day as of 7 July; Addameer lawyer Mona Nadaf visited him in isolation in Ashkelon prison, where he remains in a very small cell without ventilation. Nadaf reported that he is continuing to refuse any kind of vitamin or salt supplements and medical examinations, and only consumes water. She also reported that he is in very high spirits with unshaken determination to proceed with the strike until its conclusion. Kayed’s cell is very small; inside his cell he has only underwear and the Quran. He has been denied access to additional clothing or any other books or written materials, and the Israeli prison administration continues to refuse to provide a fan despite the high summer temperatures. In addition, the prison administration refuses to provide mineral water and he can only drink lukewarm water from the tap in the cell’s broken sink. Kayed has lost a significant amount of weight and suffers from fatigue and dizziness; he is only able to sleep one hour a night. Kayed sent his thanks and greetings to all of the people standing in solidarity with him, confirming that his struggle will continue until the end, with high morale and solid will. Bilal Kayed has been on hunger strike since 15 June in protest of his administrative detention without charge or trial. He was ordered to administrative detention on 13 June after the completion of his 14.5 year sentence in Israeli jails, where he has been imprisoned since December 2001. His administrative detention was confirmed by the Ofer military court on 5 July after a hearing which he refused to attend, noting the illegitimacy of administrative detention and the military court system. He rejected a proposal to deport him to Jordan for four years and give up political activity in exchange for his freedom. Hundreds of Palestinian prisoners have engaged in solidarity hunger strikes and protests in support of his demand for freedom. His case represents a threat of indefinite imprisonment without charge or trial for all Palestinian prisoners completing lengthy sentences. Kayed’s comrades in the Popular Front for the Liberation of Palestine are planning to escalate their protests inside the prisons, up to a collective hunger strike, beginning on Friday, 8 July; prisoners from all Palestinian factions will also engage in protest actions for Kayed’s freedom. As the protests inside the prison are scheduled to ramp up, imprisoned PFLP leader Ahed Abu Ghoulmeh was transferred on Wednesday, 6 July from Hadarim prison to Ramon prison, days after fellow PFLP leader Wael Jaghoub was transferred from Ramon to Hadarim prison. These events were cited by their imprisoned comrades as an attempt to undermine and prevent the escalation of the struggle to free Kayed. Protests and marches have taken place across Palestine (photo above from Eid rally in his hometown, Asira al-Shamaliya) for Kayed’s freedom, as well as in cities around the world. 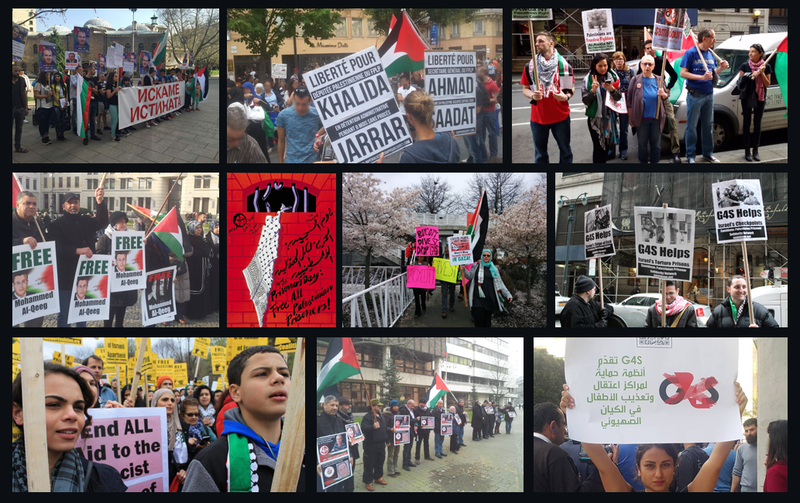 Over 150 international and Palestinian organizations have signed on to the call for action to free Kayed, and further mobilizations are planned for the Week of Action to Free Bilal Kayed between 8-15 July. Protests and events will take place in New York; Tampa; Arklow, Ireland; Manchester; London; Beirut; and Milan, with more cities to be announced shortly.